Picture this… you are taking your ship out to the open seas. There is excitement in the air. As the captain, you have the vision of where you are heading and are in tune with weather patterns and ocean currents. You keep watch of the horizon, for potential changes ahead, and you give instructions to alter the ship’s course as you see fit. You will put this vessel through it’s paces and see it in full flight. A ship in the harbour is safe, but that is not what ships are made for – so the saying goes. This nautical imagery goes a long way to helping us grasp the spiritual gift of administration and it’s place in the church today. The New Testament provides us with several lists of spiritual gifts used to build up the body of believers. 1 Corinthians 12:27-28 is the only one to mention administration, in the ESV and NASB translations that is. Other translations include words such as leadership (NLT), guidance (NIV), organisers (MSG), leaders (CEV), and governments (KJV). These are all different translations of the Greek word κυβερνήσεις, which has its origin in the word kubernao, meaning ‘to steer’. It implies leadership or governance, and has a literal sense of a helmsman, the person responsible for steering a ship. 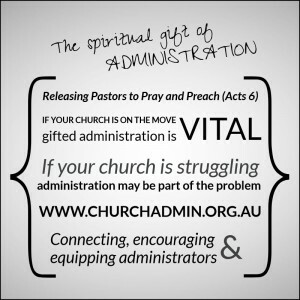 Administration is a spiritual gift essential in the life of a gathering of believers as demonstrated in Acts 6. In those days the number of disciples was increasing (6:1). The apostles were responsible not only for preaching and praying but also for the day to day running of the church. Whenever an issue arose ‘on deck’ they would have divert their attention from praying, preaching and charting the course ahead to sort things out. We can only guess at the sort of issues they had to deal with, but we are told of one: a disagreement about the distribution of food among the groups of widows. The apostles sensed that these kind of issues were diverting too much of their time and energy, so they gathered the whole group of believers and instituted the first helmsmen. There were seven who were selected to serve as the first administrators. They were of good reputation, full of the Spirit and of wisdom (6:3). They were called and gifted. They knew their stuff and were bold and courageous in their faith. Stephen, one of those selected for the role, went on to become the first martyr of the early church. And with the appointment of these administrators the number of disciples increased greatly and a great many of the priests became obedient to the faith (6:7). How was this possible? The role of a church administrator is to simplify systems, to serve the various ministries and activities, and release pastors to pray and preach. For a church’s potential to be fully released pastors need to be able to devote their time, energy and effort to vision and charting the course ahead, knowing that their church has the appropriate systems in place which are being overseen by a called and gifted administrator. The pastor at the bridge, telescope in hand, leading the way forward with the administrator at the helm ensuring everything is in place to steer the church in that direction – that’s when we get to see what the church was really made for. The NCLS has plotted the Australian Baptist movement over many years. Over the last decade the survey has highlighted the increased involvement of local churches in their local communities as they have purposed to be more missional. However over the same period the survey has also highlighted that our engagement in sharing the good news of Jesus has decreased. Over the recent weeks Crossover, in partnership with the state Baptist associations, has sponsored Refocus events in Perth and Brisbane. The aim of the seminars grew out of the conviction that as local Baptist churches we need to continue our commitment to the Gospel as deed but the challenge we must embrace is the need to rediscover our commitment to the Gospel as word. The keynote presenters were Karl Faase and Dan Paterson. Karl has recently resigned from his position as Senior Pastor at Gymea Baptist Church, where he served for over 20 years, to devote more time to his media work through Olive Tree Media. Olive Tree Media’s latest production is Towards Belief, a 10 part documentary-style DVD/TV series where Karl interviews over 30 international speakers and academics on the belief blockers to faith in western countries. Dan is a pastor at Ashgrove Baptist and a part-time lecturer at Malyon College. Dan’s study included completing bachelors and masters degrees in ministry and theology, Dan pursued further training by heading with his wife to Oxford in the UK, where he completed RZIM’s one-year course at the Oxford Centre for Christian Apologetics. • Refocus on the Gospel as word – seeking to balance the missional approach of both word and deed. • The need for thoughtful, targeted cultural change in our churches – revitalising the local church will take organisational thinking and focus. • What does the community think of the Church & Christian faith? • Creating an effective Gospel event. • Communicating the Gospel & asking for a response. • What are the questions the community is asking and how do we respond? In Perth over 50 church leaders attended the day event held at Yokine Baptist Church and over 70 were present in Brisbane at Ashgrove Baptist Church. Refocus in WA was a huge success. I have had many attendees contact me to compliment us for hosting the event. Both Karl Faase and Daniel Paterson were articulate, relevant and passionate about assisting churches to reclaim evangelism in both word and deed as our priority. Karl and Dan brought a good blend of experience and teaching that will be a huge help to all that attend. I would encourage every pastor and church leader to attend – especially Senior Pastors. The Refocus seminar held at Ashgrove Baptist on Wednesday 24 June was well supported with about 70 pastors and leaders involved. The key theme, of the place of the Gospel in word and deed with a special emphasis upon being able to share the gospel in word, resonated well and was a timely encouragement. Our speakers Karl Faase and Dan Paterson were clear, relevant and motivating as those present were encouraged to continue to live and speak out the gospel in the Queensland Context. In addition to the seminar an evening evangelistic event was held where both Karl and Dan spoke and included a Q&A session. A Refocus seminar has been planned for Adelaide in February 2016. Crossover will keep you updated via our website and social media. Click here for further information about the Refocus and Seek events is available. Click here to listen to the talks from REFOCUS QLD via Malyon College. Rev Allan Demond spoke at the induction of Rev Bill Brown as Chairman of the National Council of Australian Baptist Ministries in May 2015. He has adapted his talk into an article, reflecting on what it means to be a Baptist in Australia. Who are we? Australian Baptist Ministries have made the article on available on our website here. It is a worthwhile read for all those within our movement, and particularly Pastors, to help us form an answer to the question ‘What is a Baptist?’.